Anatomy, Feeding, Habitat, Web types, Reproduction, Life cycle, Sense, Defense and all the information about spiders. There are more than 50,000 species of spiders. We include some of the best known. Spider Facts and Information. Feeding, habitat, distribution, reproduction, anatomy and more. Facts about the Brown Recluse Spider, Tarantula, Camel Spider, Wolf Spider, Black Widow Spider and many others. The Spider can be an interesting as well as a scary creature. There are several types of them and they range in size and coloring. What may surprise you though is that generally the larger ones aren’t nearly as dangerous as some of the smaller ones. You can judge what a Spider will do based on size and looks alone. There are fossil remains to show that the Spider has been around for more than 400 million years. Yet we still lack sufficient evidence to be able to tell what occurred over time for them. There are quite a few speculations about the types of evolution that have occurred for them over time. There is plenty of diversity out there among the Spider populations. In fact, they rank 7th in the world. The only place in the world where they don’t live in on Antarctica. They are found in all forms of habitats and that includes around humans. Spiders can range in size from extremely small to very large. Some of them blend in so well with their surroundings that you won’t even know they are around. They all have four sets of legs so eight in all. They also have four sets of eyes that they use to help them because they don’t have a good sense of balance. Spiders generally move very slowly but they don’t have to worry too much about various predators. Most of them have a very powerful venom that they deliver and will paralyze predators. 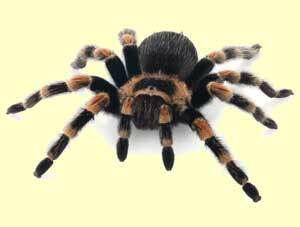 There are types of Spiders with venom strong enough to make humans very ill or even cause death. As a result many humans are afraid of Spiders. They tend to do all they can to get them out of their homes and habitats. With humans continually invading the territory of the Spider they are having a hard time finding places where they won’t run into humans. However, Spiders are very good at adapting to changing environments. They don’t need much food to survive on. These predators often find many bugs and insects. They get tangled into the webs and then they are stuck for the spider to come along and feed on. Spiders are classified as invertebrates. They don’t have a backbone. The abdominal area of a Spider is where the silk to create the webs is made. It is amazing to watch them work so diligently to create their elaborate webs. The mating process for males and females is also interesting. The females are much larger than the males. The males will deliver sperm onto a location and then the female will insert it into her body. In many instances the males will be consumed by the female after mating has taken place. It isn’t fully understood why that occurs. As a result most mature Spiders you will see are going to be female. As many as 3,000 eggs can be delivered at once for some species. There is still plenty we don’t know about the lifestyle and the life cycle of the Spider. With many of the species they are a huge mystery. Their numbers can be hard to identify too due to the fact that they have such a diversified habitat. Still, researchers continue to look for answers. Part of that research is also to find treatments that work well when someone has been bitten by a poisonous Spider. Some species of Spiders are currently in danger of extinction due to human efforts. Heavy hunting combined with loss of habitat can prove to be too much for many of them. Most humans aren’t fond of spiders and so they don’t have anything to do with saving them.